The third of four official training runs for Five Peaks. This training run is the second section of the 58km course – approximately 16km from Norton Summit to Cleland. Having done 3 of the Five Peaks in the first training run, this run takes you over peak #4 – Mt Lofty. There is also a 12km option, taking an unmarked shortcut to skip Horsnel Gully. Meet at the Cleland car park, near the toilet block at 6:15 in order to car pool to Norton Summit for an 7:00 a.m. start. We are relying on runners to self-organise car pooling and there should be plenty of others to pool with. The Cleland gates will be open from around 5:00am. Your volunteer leaders for this run are Steve Burdett and Murray Waters. This is a free “social run” – for more information on what to expect at a social run, click here. Mal and Merry, our wonderful volunteers who provided the amazing spread at our Belair training run, will be waiting for you at Cleland with a delicious array of food again. If you are doing the 12km, make sure you are familiar with the shortcut (bypassing Horsnell Gully). It’s not complicated but if unsure, load the GPX into galileo on your phone or print the map from our website. We will be following the Yurrebilla trail until the final 4km so the trail will not be marked until that point (follow the permanent Yurrebilla trail markers instead). When you have approximately 4km to go, our trail marking starts, taking you up to Mt. Lofty (Peak #4) and back down again to Cleland. The course takes you on a quick diversion up to the Summit plaza, clockwise around the monument, then back down again. Take care as it is a busy area. On April 14th, this will be the spectacular location of an aid station. For runners on Sunday, there is a drink fountain there for refilling your water as well as a toilet. 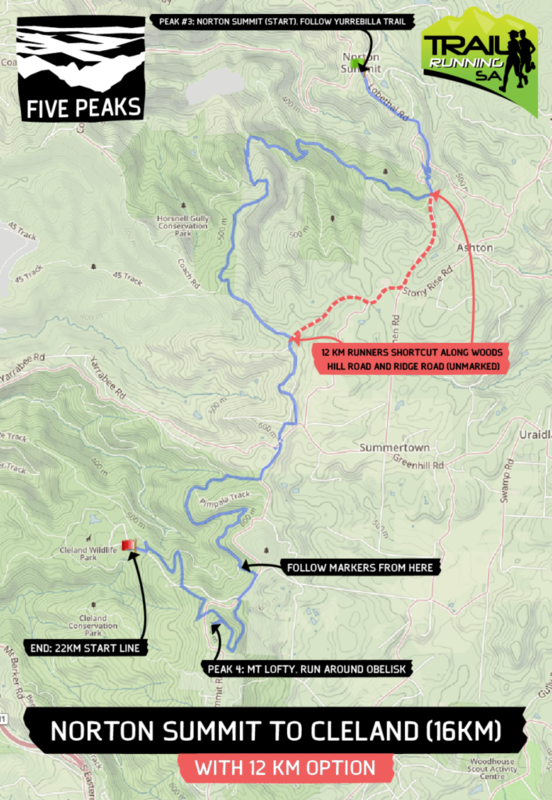 Click here for directions in google maps to the Norton Summit start area. Please do not park in the Scenic hotel as this is reserved for paying customers. We are relying on people to car pool so please head to Cleland and co-ordinate rides Norton Summit from there. Carpooling from cleland is from the Cleland car park, near the toilet block . Click here for directions in google maps to the Cleland finish area which is further up the main access road.